This week’s show reacts to Marc Trestman’s introductory press conference as the new XFL Tampa Bay Head Coach/General Manager. We also welcome Dave “Softy” Mahler from 950 KJR in Seattle to discuss Jim Zorn and the XFL taking over CenturyLink Field next February. Also get the latest on a new XFL Football Ops hire, a conversation on a potential innovation to be tested during The Spring League, and more fun with the XFL salary tiers! Targeting: Kyler Murray has no leadership skills, the Cards will trade Rosen, and other NFL Draft misinformation. The XFL’s plan to entice quality young players is taking shape, so we are breaking down the Action Network’s report on just how the league intends to do that with special signing bonuses. Also get the details on how many players can be signed to each team based on what salary tier they fall into. In addition to all the nerdy salary talk, we also recap and grade new Seattle head coach/general manager Jim Zorn’s press conference while speculating on the upcoming Tampa head coach press conference. March is here and the coaches keep on coming! Join us for another pivotal week on the road to 2020! Coin Toss: Would you call the AAF a “hit” so far? Targeting: With the lawsuit against the AAF revealing that the AAF was originally going to be the new XFL, is it possible Vince McMahon is bringing his league back out of spite? No Huddle: Covering Johnny Manziel getting banned from the CFL, Foles not franchised, female Football players, the Raiders QB situation, the Memphis Express searching for a W, and a whole lot more! Pep Hamilton was officially introduced as the head coach/general manager of XFL D.C. this week. Join us as we discuss the hire and what type of team Hamilton will mold D.C. into. We also dive into the XFL’s next round of rules experiments, this time with the interactive Your Call Football series. During this week’s Hot Read, get all of the latest details on XFL team names and when they will be announced as well as a look at the league’s time frame for announcing coaches. Get caught up on everything the XFL has planned in the coming months regarding player signings, QB salaries, practice facilities, and more. It is an information packed episode full of XFL news you need to know! While Bob Stoops is currently the only officially announced Head Coach/General Manager in the XFL, there are reports surfacing about a few other notable coaches who could be announced very soon. This week we take a detailed look at Pep Hamilton, Jim Zorn, and a couple of other coaches being discussed as candidates during the Hot Read. RJ Choppy of 105.3 The Fan in Dallas also joins the show to talk Stoops and all things Dallas Y’all! Also, the spotlight is put on two very well respected names in the Football community who will be consulting with the XFL. Dean Blandino will lend his officiating expertise to the XFL while QB guru Tom House is going to provide help to the league’s quarterbacks. Learn more about Blandino and House during this week’s Cover 2. Major rumors surfaced this week about the XFL negotiating with Fox and ESPN to air games in 2020. Is it too good to be true? This week’s show hammers out why the XFL might be so coveted by the networks. We also spotlight the newly hired President and COO of the league, Jeffrey Pollack and what kind of impact he will make on the business side of the XFL. Oliver Luck revealed that a TV deal should be announced in “about three weeks” which is right around Super Bowl Sunday. 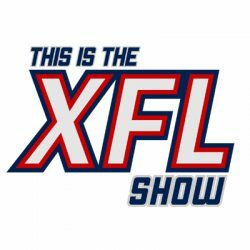 This week’s show features a discussion on the XFL reportedly getting many great broadcasting offers as well as the chances the league runs an ad during the Super Bowl. On this week’s Hot Read, we recap the alarming Outside the Lines report about the many insurance issues Football is facing and how it may change the game from pro leagues like the XFL and NFL down to youth Football. It’s a deep conversation on a heavy topic, but an essential conversation that has to happen on a show for Football freaks like This is the XFL Show!